Topics: Thank You And Goodbye, Textile, and Creativity. 61 users visit the site each day, each viewing 1 page. 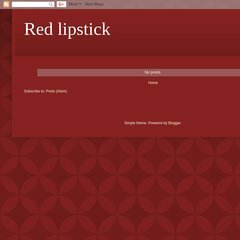 A-red-lipstick.blogspot.com's server IP number is 72.14.204.132. It is hosted by Google Inc. California, using GSE web server.